RIDES! LIVE ANIMALS! SHOWS! ATTRACTIONS!… & SANTA!!! You will be face to face with some of the most beautiful, wild and exotic animals from around the world, such as deer, kangaroos, exotic birds, bears, porcupines, monkeys and much more! Some you can pet and feed! Watch us feed the Baby Black Bears! The whole family will smile when you see these adorable babies run, play and drink from a bottle! 3 shows a day, allows you to watch and photograph these cute and fuzzy cubs. Be Amazed At The Magic Show! Ride as much as you like! From mild to wild, we have the rides that make kids smile! Fun for parents too! Game Room and Arcade Fun! From Skee-ball to pick-up-ducks and air-hockey to basketball, we’ve got it all! Everyone can enjoy, so don’t forget your quarters! We have an amazing variety of candies, homemade fudge, deli sandwiches, pizza and more at Mrs. Clause’s Kitchen, burgers, hot dogs, fries, nachos, and hot pretzels at the Depot Diner, funnel cakes at Kris Kringles, and snowcones at Whitebeard’s Lake. 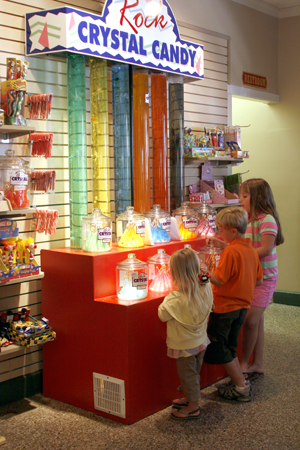 Our gift shops – Santa’s Christmas Gift Shop, Frosty’s Shirt Shop, The Magic Store, and Rudi’s Zoo Emporium are stuffed full with an incredible array of gifts, collectibles, souvenirs, and much more.